There once was a family who manufactured a little camper trailer known as the Skipper, which became more and more popular. Some of the trailers traveled to all four corners of Southern Africa, and the family eventually ended up forming a company making the Gazelle range of caravans. The Kerkhof Gazelle, as it became known, was hand built by the Kerkhof family, who owned the company until they opted for early retirement down at Pennington, Kzn. 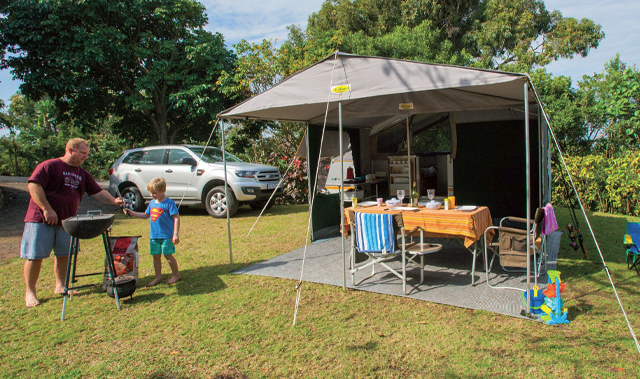 But, with camping blood flowing through all their veins, Robbie, wife Jenny and son Reinhart decided to add a new element to their successful caravan history and re-launch their famous little Skipper Tent Trailer. Now the Skipper Tent Trailer has made a comeback. Just in time too, with fuel prices being so volatile and not everyone being able to afford big powerful tow cars, a tent trailer makes good sense. 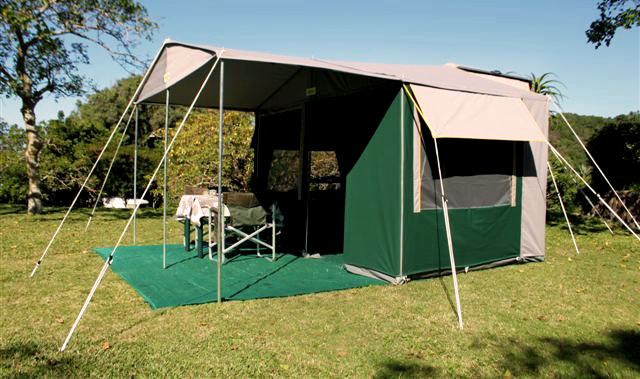 In its fold form the Skipper is quite a graceful looking unit in spite of its functional flat top look, without a doubt a compact tent trailer such as the Skipper puts a holiday within one’s budget. 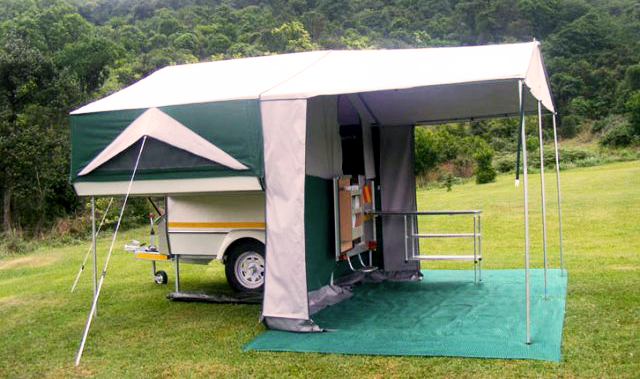 Much thought has been put into the design of the body and living areas of the Skipper Tent Trailers. The tents are manufactured in our own factory with daughter in law Charmaine in charge. The canvas we use is 100% cotton canvas, which perform well in bad weather as the fibres swell to create a watertight material when wet. The basic construction of the trailers includes an aluminium frame, with white fiberglass body panels that are highly resistant to stone damage and rust. The fold-out, expanding canvas section of the body has most of the poles already attached in place to the canvas to simplify setting up camp.